Albena is among the quietest and calmest resorts on the Black sea. Thanks to its specific landscape – sea and wood, the resort is preferred by more sedate of the Bulgarians and foreigners who are willing to escape from the stress and pressure of the everyday life and enjoy a real holiday. 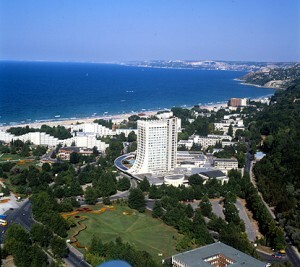 Locates 30 km from Varna and in proximity to Balchik Albna is famous for its wide sea strip of 150 m.Constructing of Albena starts in the summer of 1969 as today the resort is crowded by many modern hotels serving a lot of comfort and entertainment.Its proximity to the Botanical Garden of Balchik and the Baltata Park is just one of the many facts that attract so many tourists and fans of the flora all over to world. Baltata is a quiet park on the mouth of the Batowa River famous for its dense flora. The visitors have the chance to enjoy many kinds of trees – elm, hornbeam, poplar, willow, hawthorn, hazel-bush and many others. Here you can see some of the largest trees in Bulgaria as on the same time observe the fertile animal world. In Albena the time goes slowly there is not any rush as in Sunny beach for example. It is only here where a man can enjoy the true nature that has been recently rejected in order of the lights and parties. In Albena you can find yourselves, your mind becomes clear and accepts the beautiful things. Make use of our services and visit this wonderful and one Bulgarian resort. Afford yourselves the comfort to drive a new car on a low price. Just imagine going to a holiday by Peugeot 308, BMW 5 or BMW X5 with no overloading the family budget. Rent a car online by visiting our site www.irent.bg and get up to 10% discount. All you need to do is just to fill the blank for less than 10 minutes and state he exact time and date of the pick-up. Irent possesses a large car-park and guarantees you will find exactly what you are looking for on an acceptable price. Renting a car for a longer period of time will bring you extra rebates. The best advantage of ours is that the price includes all the road assistance taxes and insurances and last but not least an unlimited mileage. All of these facts have made us a leader on the Bulgarian market. We have limos, luxury busses and other vehicles for a transfer of a large number of people. We will provide you qith professional drives who will take care of your and your guests’ safety. Visit our Black sea coast by our cars and enjoy the comfort, safety and many nice emotions. Leave you troubles to the professionalist and have a perfect holiday in Albena!